The newest blossom growing in the paradise of Punta Cana, Dominican Republic. Located 15 minutes from Punta Cana International Airport (with direct flights from major US, Canadian and European cities), this collection of villas, townhomes and condos puts the beauty and luxury of vacation living easily within your reach. And presents one of the best values in the Dominican Republic. Right now, a second home in a Caribbean paradise is amazingly affordable. And even more so for those who are among the first to take advantage of this limited opportunity. The journey begins here. Your journey to a lifestyle that every day exceeds your expectations —but falls far short from your cost expectations! 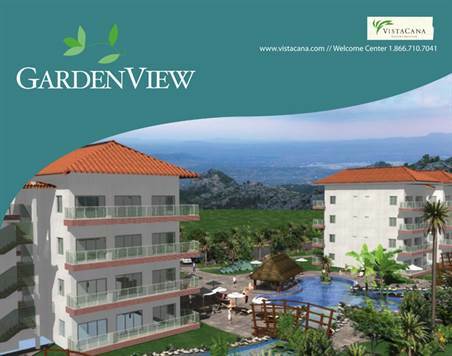 These are VistaCana most affordable offering with prices starting in the low 100's for 1 and 2 bedroom apartments. These will be 4-story buildings with elevators, central air conditioning, and high quality finishes. Theme pool makes Garden View a great place for rest and relaxation. Development pre approved for financing by Banco Popular Dominicano. All deposits and payments will remain in escrow with Stewart Tilte until closing.